The New Humanitarian | Briefing: Can federalism work in Somalia? Briefing: Can federalism work in Somalia? On paper, federalism appears to be central to today’s Somalia. “Federal Republic” is part of its official name. It is run by a “federal national government”. “Federal, sovereign and democratic” are the country’s defining characteristics, according to Article 1 of the 2012 provisional constitution, a document in which the word “federal” appears 710 times. But in the wake of more than two decades of civil war and state collapse, Somalis disagree about whether federalism is a recipe for sustainable peace - and even whether such a system is practicable. This briefing examines the issues. What does federalism mean in Somalia? Federalism is an ambiguous notion, involving relationships between central and peripheral power structures that vary widely from country to country. In Somalia, the constitution outlines the connections between the central government and future “federal member states,” but the precise roles and responsibilities of each level of government are not specified. Article 54 states: “The allocation of powers and resources shall be negotiated and agreed upon by the Federal Government and the Federal Member States” pending their creation, except in the areas of foreign affairs, national defense, citizenship and immigration, and monetary policy, which are all under the purview of the central government, based in the capital, Mogadishu. The federal member states will be represented in parliament through the Federal State’s upper house of parliament, which has yet to be created. “My own feeling is that the nature of Somali federalism remains far from agreed,” Michael Walls, senior lecturer at University College London and a leading expert on Somalia, told IRIN by email. Is federalism new in Somalia? “Somalia has tried many systems of governance since its independence,” Abdulkadir Suleiman Mohamed, a writer and political analyst, told IRIN. After independence, the country followed the British model of a parliamentary system, until the 1969 coup d’état, when the military government installed a “scientifically Socialist” state. “Resource-sharing, power¬-sharing, political representation - all have been abused by certain people in the higher ranks of the government. Welfare services have never been delivered. Local constituents never received their share of national resources. So federalism was proposed a way forward in Somali politics,” he said. Abdi Aynte, director of the Heritage Institute for Policy Studies (HIPS), agreed that Somalia has come to see federalism as a viable solution to restoring peace. “Due to the prolonged civil war and the resulting trust deficit, Somalis are yearning for local control of their politics. Decentralization, or any other form of federalism, is the answer to their quest,” he told IRIN by email. “Federalism will disperse power among the states, and will thus reduce the concentration of power on central hands. It is the best form administration we can implement today in Somalia,” Mohamed Nurani Bakar, a member of parliament, told IRIN. The “unitary system of governance has brought us a lot of problems that are still with us today,” he said. Who creates the federal member states? The process of creating most federal states has been fraught with delays, contestation and confusion. Under the provisional constitution, all federal states must be built from among the 18 regions that existed prior to the civil war. “Two or more regions may merge to form a Federal Member State,” according to the constitution. But an independent boundaries and federation commission, responsible for determining the number and boundaries of federal states, has yet to be formed by parliament’s lower house, leaving regions unsure of their legal status under the provisional constitution. The commission was meant to be appointed 60 days after the new Council of Ministers was formed following the passage of the draft constitution in 2012, but that never happened. “The creation of Federal Member States proved to be a very controversial issue during the constitutional conferences leading to this Draft Provisional Constitution,” noted a guidebook created by the UN Political Office for Somalia. For this reason, the constitution specified that the process of deciding federal member states will be carried out by the independent commission comprising representatives from all of Somalia and international experts. Officially, no federal member states exist yet, and the government has until elections in 2016 to create them. It is widely believed that Puntland is the closest to achieving federal state status, and could be a model for other states. Jubaland and Galmudug also have state-building efforts underway, although there is a lot of in-fighting at the local level. Jubaland has two rival talks going on while Galmudug has three or four. What’s the importance of Puntland? Puntland has described itself as a semi-autonomous entity since 1998 with varying relations with Mogadishu. A recent presidential election, won by Abdiweli Gaas, seems to have put an end to a period of animosity. Somalia’s President Hassan Sheikh Mohamud reacted in a statement: “I extend my personal congratulations to Abdiweli Mohammed Ali Gaas and I look forward to working closely with him as the government continues to build a federal Somalia. Gaas’s predecessor, Abdirahman Mohamed Faroole, “used the conflict/tension with Mogadishu to shore up his domestic - i.e., Puntland - support base, whereas Abdiweli Gaas draws his strongest support from international actors and many in Mogadishu,” said Walls. What is happening in Jubaland? There are two separate processes taking place in Jubaland. One is the Intergovernmental Authority on Development-brokered talks between a delegation led by the Ras Kamboni movement (a paramilitary group opposed to Al-Shabab) leader Ahmad Madobe, and the SFG. In August, they signed an agreement in Addis Ababa, creating a Juba Interim Administration led by Madobe that will be in place for two years. The talks say that during this time, “subject to the constitutional process, a permanent Federal Member State will be established.” The crucial port of Kismayo and the airport will be managed by the national government during this time. The launch of the Interim Jubba Administration ceremony on 20th January 2014 at the Jubba Statehouse. Dignitaries at the official launch of the Interim Juba Administration, which has a mandate for two years. 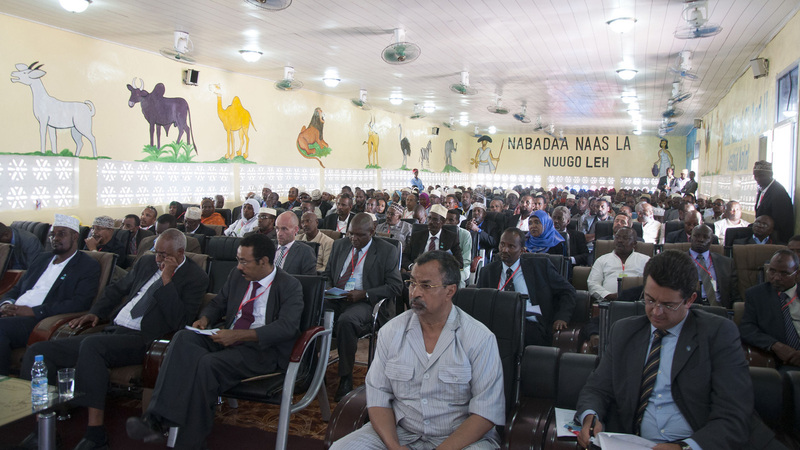 The formation of Jubaland in southern Somalia was initially met with opposition from Mogadishu, which accused a conference of stakeholders in February 2013 of being unconstitutional because it was “carried out without reference to the federal government.” Politicians in the Juba and Gedo regions, areas within the proposed borders, also protested that the Jubaland leadership would not be representative of all of the clans living in the region. A separate bid to join regions in Jubaland is also progressing. The Baidoa conference is attempting to join together Lower Juba, Middle Juba, Lower Shabell, Bay, Bakool and Gedo. The conference has been ongoing for over a year, with some support from the federal government, despite the SFG having signed the Addis Agreement. Tensions are running high between the rival state formation talks. Last week, reports emerged that troops from the African Union Mission in Somalia had attempted to take over the conference hall where the Baidoa conference was taking place, to stop the meeting. Jubaland will have significant regional importance - the Kenyan government would view it as a vital buffer zone between Somalia and northern Kenya, offering protection against Al-Shabab. Ethiopia would also see it as a vital shield to its territory, provided Jubaland’s leadership was not sympathetic to the Ethiopian rebel group Ogaden National Liberation Front. What are some of the other challenges facing federalism? Civic education, distribution of resources between state and national governments, and the status of Mogadishu are also major challenges. Aynte of HIPS recommends the creation of a body responsible for national civic education on federalism. Most people are not aware how diverse federalism is or the options available for decentralization. There also needs to be national dialogue on the role of national and local authorities in controlling revenues from natural resources, he believes. This is likely to be an area of conflict between the federal states and central government, which would want greater control of oil revenues, Farah believes. Third, the issue of the status of Mogadishu has yet to be discussed. It could occupy the place of a special city outside of the federal states system, like Washington, DC, or Canberra. Analysts believe that this debate will be likely to come to the fore once federal boundaries have been negotiated and delineated. Are there any opponents to federalism? Yes, some. Opponents of the federal project worry that it could lead to fragmentation and clan violence. “Federalism is a destructive force for Somalia, and it will continue to remain one whose woes will haunt Somalia,” Abdulkadir Sheikh Ismail, former chairman of the parliamentary committee on constitutional affairs, told IRIN. If “regional state interests take prominence over the national interest, the common interest is lost as a result, and that could set a dangerous precedent,” he added. Asked about what he thought of federalism, 23-year-old Ayuub Suleiman Jama, who grew up experiencing years of clan clashes and religious fanaticism, responded without hesitation. “Division,” he said.